I have never read anything by this famous Science-Fiction author. I have heard so much about him and now it was time to read something by it. It was interesting, but not what I expected. 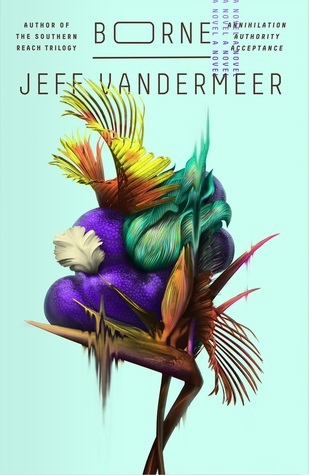 I give Borne by Jeff VanderMeer four out of five hearts because it was a very strange tale. Jeff VanderMeer has a very interesting way of writing and world building. Even though I wasn’t interested in the main character, Rachel, I wanted to know who or what Borne was. It kept me hooked up until the last few chapters. Jeff is a great author, with good descriptions and still keeping the world engaging and interesting. The author needs to have all these qualities because otherwise Borne would not have worked out. Borne itself is visually hard to pin down and changes into all kinds of shapes and writing that is hard. It was done lovingly and without too many words. Borne is and stays a story element and is cleverly done. The world building is great, a full world without anything missing. But he lost me at some point in who the actual antagonist was of the story. I still don’t understand it really, but Borne’s story itself was good enough. Overall I liked Jeff’s writing and I am curious if Annihilation is just as interesting and maybe a little bit clearer in who full filled which role. This entry was posted in Book Review and tagged Book Review, Drama, Dystopia, Jeff VanderMeer, Mystery, Romance, Science-Fiction. Bookmark the permalink.